Award-winning critic Elaine Scarry provides a vital new assessment of leadership during crisis that ensures the protection of democratic values. One of the most vexing human rights issues of our time has been how to protect the rights of individuals and communities worldwide in an age of globalization and multinational business. Indeed, from Indonesian sweatshops to oil-based violence in Nigeria, the challenges of regulating harmful corporate practices in some of the world’s most difficult regions long seemed insurmountable. Human rights groups and businesses were locked in a stalemate, unable to find common ground. In 2005, the United Nations appointed John Gerard Ruggie to the modest task of clarifying the main issues. Six years later, he had accomplished much more than that. 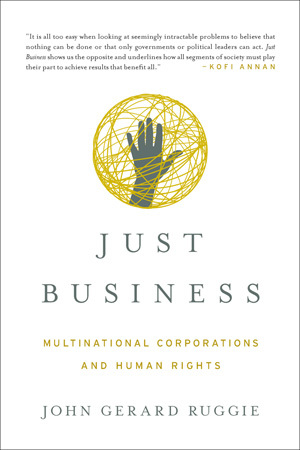 Ruggie had developed his now-famous "Guiding Principles on Business and Human Rights," which provided a road map for ensuring responsible global corporate practices. The principles were unanimously endorsed by the UN and embraced and implemented by other international bodies, businesses, governments, workers’ organizations, and human rights groups, keying a revolution in corporate social responsibility. Just Business tells the powerful story of how these landmark “Ruggie Rules” came to exist. Ruggie demonstrates how, to solve a seemingly unsolvable problem, he had to abandon many widespread and long-held understandings about the relationships between businesses, governments, rights, and law, and develop fresh ways of viewing the issues. He also takes us through the journey of assembling the right type of team, of witnessing the severity of the problem firsthand, and of pressing through the many obstacles such a daunting endeavor faced. 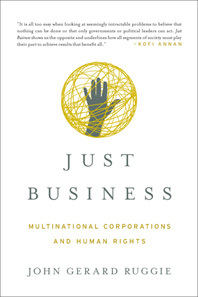 Just Business is an illuminating inside look at one of the most important human rights developments of recent times. It is also an invaluable book for anyone wanting to learn how to navigate the tricky processes of global problem-solving and consensus-building and how to tackle big issues with ambition, pragmatism, perseverance, and creativity.